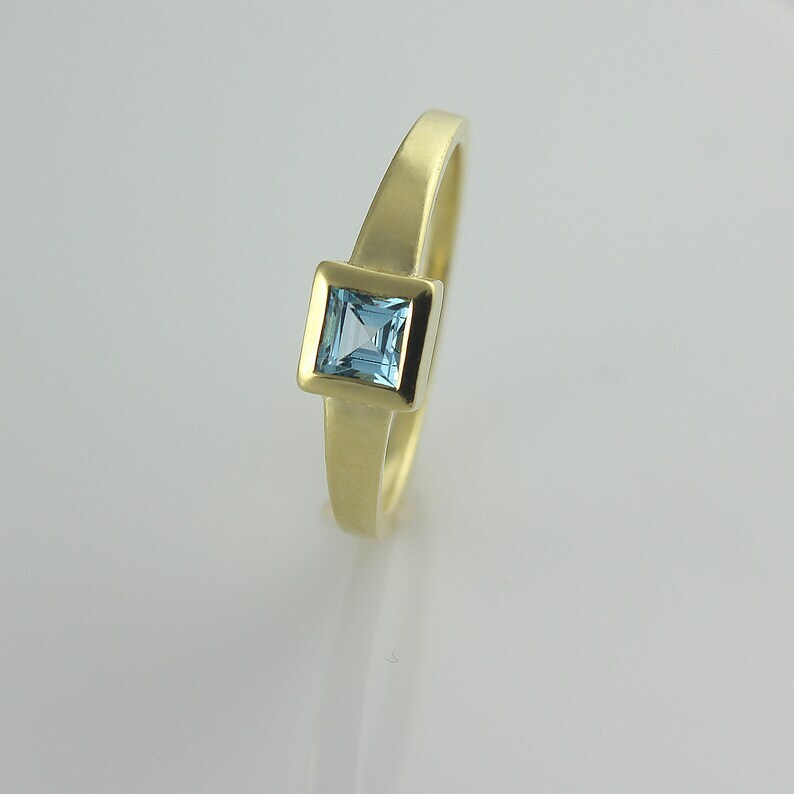 14k / 18k solid yellow gold engagement ring for women, with a stunning square blue topaz solitaire gemstone. Great choice for a unique engagement band! Fabulous 14k solid yellow gold and blue topaz engagement ring for women. The shape of the stone is square which makes it even more unique as an engagement band for your special someone. The Topaz gemstone is nestled in a solid 14k yellow gold nest, keeping it safe from harm for years to come. The band it self is smooth and super comfy to wear. The gold is timeless and will match any outfit from casual to evening. Over thousands of years, the topaz stone was mentioned in relation to glory, prosperity, generosity and power. The energy of the topaz draws its power from the sun, has managed to transcend time and space, and make the topaz one of the most beloved and selected gemstones as a precious gift. Don't miss this rare opportunity and add it to your cart today! * Wide part width - 3 mm / 0.118"
* This part width - 1.4 mm / 0.055"
* Thickness - 1.4-2 mm / 0.055 - 0.079"
* Nest of stone - 5.5 mm / 0.217"
* stone size - 4 mm / 0.157"
Ring is available in size range 3.5-9. Please choose your accurate size from the drop down menu before check out. Ring is available in both 14k and 18k fine solid white gold. Please choose your preferable material from the drop down menu before check out.